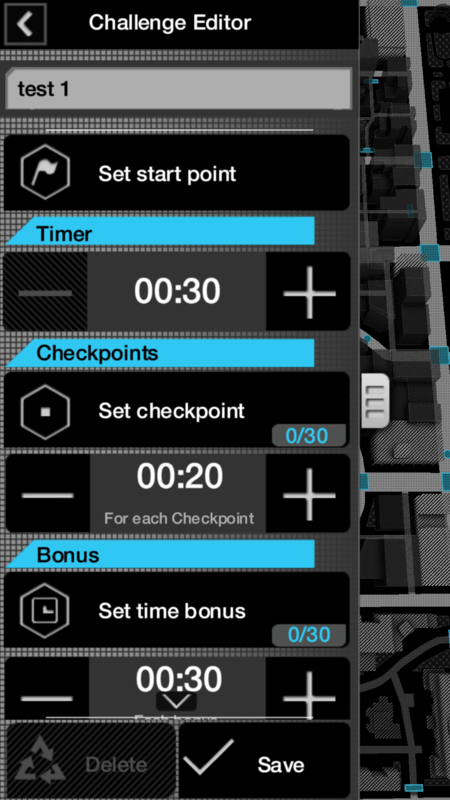 Ubisoft released a companion app on May 27 2014 to play with / against other Watch_Dog players from your Android. The game is officially called Watch_Dogs Companion: ctOS on the Google Play store and on its initial launch had the same problems as Watch_Dogs did with the UPlay servers. It was very buggy and hard to log in but that could just be because they are connected to the same servers. Now that the hype of initial release has died down, there doesn’t seem to be anymore UPlay login problems. From saying that, it seems fairly obvious that you need a UPlay account to use this app, but you do not need to own the Watch_Dogs game which is nice. You can get some of the experience through the mobile app which is free and play against players who own the game on their PC or Console. Watch_Dogs Companion: ctOS main objective is to put the user on the opposite side of the storyline compared to the game. You play as the police trying to stop the players from doing missions while looking down on them in a birds eye view. You fly around in a helicopter and you use your “Heat points” to call backup or hack into the ctOS network and change traffic lights or raise bridges, just like you would in the game as the vigilante. The app is very well laid out. The game transitions from tutorials into gameplay nicely and you don’t feel like you missed something or have to figure something out yourself. Like I said earlier, the game had some problems which the login servers but it has seemed to have resolved itself but I have noticed that the game crashes every once in a while on my Samsung Galaxy Note 3. The game is internet only as there is no offline mode and when searching for an opponent, it can take some time. I have waited a good 5 mins searching for a game at some points in which I close the search and start a new one, and I get a game right away. That makes me think that there are still some server hiccup problems since I tried on both my cellphone network and my home network. When flying your helicopter around, you have to get used to multitasking in the game. If you don’t, your helicopter will fly away from where the red car is going, and you will lose him, which is a b ad thing. You want to keep your helicopter close to the red car because that is how you gain “Heat Points”. The currency to call for backup, or hack systems, which is another thing to keep track of. You also have to keep your eyes on the squad cars you called along with all the objects in the game in which you hack into to try and stop the car. If you win or lose you get experience, obviously if you win you get more experience. Experience is then used for your levels, in which every level you get points . With these points you upgrade your arsenal of items to try to stop the other player. Example upgrades are additional patrol car slots, upgraded patrol cars, increased helicopter WIFI range, and upgraded sniper (Yes your helicopter has a sniper in it). Each upgrade costs more as you progress and more powerful upgrades in game cost more heat points to use. An example of this is a regular patrol car costs 1 heat point, where are the SWAT SUV costs 9 heat points to call. You can join up with your friends via Xbox Live and Playstation Network and challenge them into matches. Along with that, you can create your own custom races for them to try to win. You set this all up in the Challenge Editor. In there you set the waypoints where you want, the time of day, the weather, and how much time between waypoints. Once you have that complete, challenge your friends and test it out. Unfortunately there is no way to test your challenge solo. The graphics for ctOS Mobile Watch_Dogs are very crisp. They are pretty basic but they are very clear and smooth. The menus are big buttons which are easy to click and read. The graphics and colors coincide with the full video game and give the mobile user great immersion into the ctOS gameplay and system. Since I tested this out on my Samsung Galaxy Note 3, the size of everything was fine for me but I could see how on smaller screened phones that it might be a little to small for some users. For the full experience I would say this game would be best on a tablet. The audio sounds in the app are very professional. Crisp and clear but it has the crackling static sound that a radio would have. There is background music that fits the high speed action and changes to a slower, more peaceful sound when you are in the menus. Sound effects are on queue, without lag, and once again, make you feel immersed into the game. 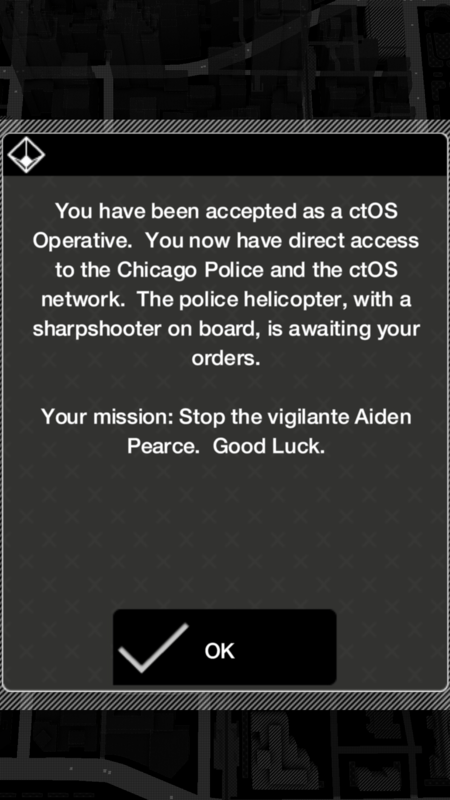 ctOS Mobile Watch_Dogs is an amazing addon to those addicted to Watch_Dogs and even better for those who don’t have the original game. For a free app from a big game publisher with this many features and play-ability is amazing. Ads are almost non-existent, load times are decent. and other than the few bugs is overall a very well done game app. Currently the app is available for both Android and iOS and is currently supported on the following devices. Have you got the app? What do you think? Leave your comments below!